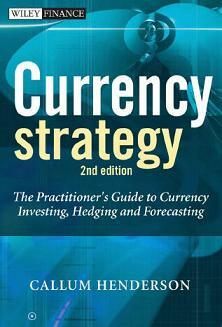 Currency Strategy 2nd Edition is the Practitioner’s Guide to Currency Investing,Hedging and Forecasting. Currency Strategy is all about theory, strategy and execution. Ultimately, the aim in writing the book was to fill what I "the author" perceived to be a gap in the available literature on the global FX market, preferably in a user-friendly manner for currency market practitioners, and ultimately to provide a more appropriate framework for analysing and managing their specific currency risks. Writing on any subject is, as ever, somewhat of a trial balloon; you hope what you have to say is interesting and worth reading, but you never know for sure until the book leaves the shelves.